Welcome to Marvel Strike Force Minions page. This is the full description of MSF Mercenary Soldier stats, skills, and abilities. In Marvel Strike Force, Mercenary Soldier is a Mercenary minion who can attack multiple targets. A mercenary is an individual who fights for money in various types of armed conflicts and who is not part of any government or political cause. In the Marvel Universe, the most famous mercenaries are Deadpool, Bullseye and Korath the Pursuer. Mercenaries have no nation, they don’t worship any God and have only one boss – money. Mercenary soldier is obtainable at the beginning of the game when you start villain campaign missions. His shards can be found in raid supplies, raid orbs, premium orbs and violent vigilante orbs. Mercenary Soldier has decent damage output and smoke grenade ability which strikes the main target and adjacent units. When you upgrade his passive ability Mercenary Soldier, damage is enhanced by 20%. Mercenary Soldier cannot be summoned by Kingpin. Mercenary Soldier is a versatile soldier who can inflict area damage with grenades. Attack primary target for 100% damage. 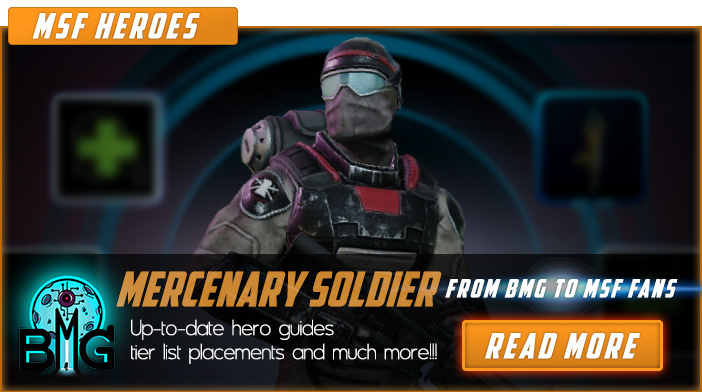 We hope that you enjoyed the description of MSF Minion Mercenary Soldier. For detailed information about other MSF Characters check our MSF Minions page.